An Accu-Quilt Go-Baby give-away! Along with some other fun give-aways the next few weeks. 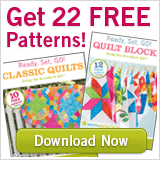 Stay tuned...Before that particular brand of summer fun happens, though, Accuquilt is giving away 22 free patterns to people who sign up for their email newsletter, so hop over and sign up! I love your patterns - especially "Garden Paths"
I just come over from The Fat Quarter Shop... And now I am a follower here too! Love your patterns -- especially Blossoms and Garden Path. Thank you for this giveaway at the Go!Fabric Cutter site.